Time sure passes quickly! Seems like we just arrived in the States and it’s already time to go back to Chile! But before we go, we just want to do some “giving of thanks” as well as presenting some prayer requests. This furlough has been very unique. Only four months long, our main focus has been on family needs. Because of that we have not been to as many of our supporting churches as we would have liked. The few that we were able to visit were wonderful blessings and we enjoyed so much seeing “old” friends and meeting new ones! Some of these churches have supported us and prayed for us for more than 23 years! For those who we were not able to see, we ask your forgiveness. We’ll plan on next time! Just to give you an idea of the many blessings during this short furlough. We made it in time (by God’s grace alone!) for Becky’s graduation from Bob Jones University on May 8th. Melody’s parents were also able to go. We are so thankful for how the Lord was with Becky during her schooling, providing for her, upholding her and causing her to grow. We must admit to shedding a few tears of joy as we watched her receive her diploma! After graduation we had about a week together as a family. The Lord provided a place for us to stay free of charge in Tennessee. We were able to picnic, hike, enjoy God’s creation and even go tubing in the Smokey Mountains! We are thankful for that family time. It was short, however, as we then had to take Jeremy to Cashiers, NC where he would be working (doing his culinary internship) for the summer. We are thankful for the Lord’s provision for Jeremy this summer. He has learned so much and has also enjoyed being in such a beautiful place. Shortly after that we traveled to West Virginia to take Becky to “Boot Camp” for the S.O.M.E. team and then take her to the airport for her 3 week mission trip in Kenya. The Lord provided so wonderfully and gave the team a great trip as well. We are so thankful. After seeing Becky off to Kenya, we headed West. 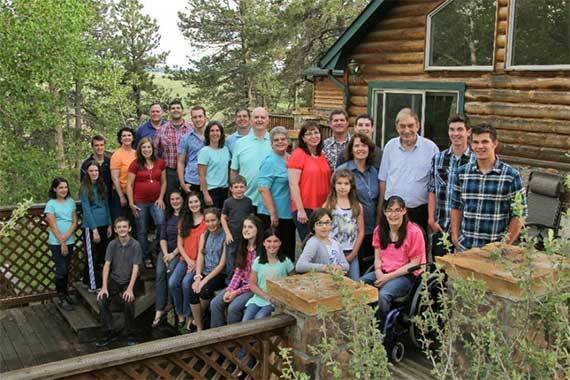 All of Melody’s family (except for four of the grandchildren) was able to get together in Melody’s brother’s home, near Colorado Springs for a family reunion. This is actually the FIRST time all siblings with spouses have been together! What a wonderful time we had. Debbie enjoyed so much being with all her girl cousins. J We were able to see such beautiful sights: Pike’s Peak, Garden of the God’s, waterfalls, etc. We ate S’mores, sang together, played games and of course talked and talked! We thank the Lord for such an enormous blessing. Then we headed back to West Virginia to pick Becky up at the airport and hear of all the Lord’s doings in Kenya on the mission team. Thank you so much to those of you who prayed and even supported her on the mission team. It was a life-changing experience for her. The Lord provided for Debbie to go to camp at the Wilds near Brevard, NC, which also happens to be near Cashiers where Jeremy was working. So we were able to go see him, meet his “boss,” and hear that he was doing a great job! Debbie had a great time at camp and was so thankful she was able to go. From there we went to Snow Camp, NC, to stay in the Siloam Missionary Homes. There is no way to fully express how grateful we are for the two months that we have been able to stay here! Besides being able to finally unpack (after two months of living out of a suitcase), and having our “own” house to relax in, cook our own meals, etc., Siloam has been a place of spiritual renewal. Jim has attended the morning men’s prayer meeting every day since we’ve been here and it has been such a blessing to him. The staff here is made up of wonderful people and hard workers. As you drive into the property you see flag poles with all the flags of the different countries represented by missionaries staying here; South Africa, Turkey, Tanzania, Ireland, Guam, Taiwan, Germany, and of course, CHILE! We just must “give thanks” for this wonderful “home away from home”. Now we are getting ready to leave. 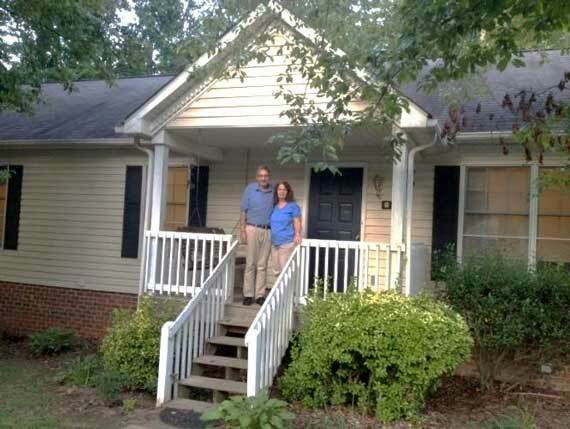 We take Becky to the airport in Charlotte on Tuesday, August 25th, where she will leave for China. She will be teaching at an international school there for the next two years, Lord willing. We would appreciate very much your prayers for her there! We have to admit to a little anxiety, but we are thankful that she is going with a good friend and, of course, the Lord will be with her too. We also have to pick Jeremy up in Cashiers, and then head down to Bob Jones where he will start his sophomore year. We appreciate your prayers for him too! After getting him installed in school, then we will be heading up to Philadelphia where we fly out on September 9th, arriving in Chile on the 10th, Lord willing! We have enjoyed our time in the States, but are anxious to get back too. We thank the Lord for His goodness to our church in Arica while we’ve been gone. We often say that they do better when we are gone! The brethren have really stepped in and worked hard to keep things going and even helping with the preaching in the Jara’s church during Jonathan’s absence. We thank you for praying for Janeth’s health. She and Jonathan had to go to Antofogasta (about 10 hours to the south of Arica) for about 6 weeks for her radiation and continued chemotherapy. They are back in Arica now and she will have a month rest before starting another round of chemo. The Lord’s grace has been very evident and though she has lost a lot of weight she is doing well, always giving testimony to those around her of God’s goodness. Pray for Becky’s trip to China and that the Lord would take care of her and use her. Pray for Jeremy as he starts up classes at BJU. Pray for our travels back to Chile on September 9th and 10th. Pray for Janeth and her continued cancer treatments. Pray for us as we get back into our ministry in Arica. Pray for the young lady coming to study in Arica. Pray for each of us that we will reflect the Lord Jesus in our lives, for one of our children who is unsaved and for the Lord to guide us as to the future. But I can plead upon my knees to rescue souls from hell. But I can tell, “for me He came to die,” and I can go to God and pray. But for those who do, I can plead and in prayer uphold their hands. Though I may not be on the battle front, still I can play a part. I can pray as they take the brunt; I can be there in my heart. But I can give to Christ my best, and for the Savior live. I can follow Christ faithfully, and be an example that’s true. But I can cross the line at last and finish by His grace. But I can be faithful and always there, and bring glory to my King. Thank you so much for your faithful prayers for us. Sometimes it is hard to keep going, to keep serving, and to keep loving. But God in His grace uses your prayers and strengthens us and sustains us. It is still true: we could not be on the mission field if it were not for the faithful prayers of God’s people!